Influenced by the springs of Jinan, the interior design delivers a stylish representation of fluidity and linear tactility of the water form. Traditional elements of unique local architecture and culture are broken down and re-constructed into a holistic and urban space. Modern bespoke furniture, signature artwork selections and tactile layering of details and finishes refine the hotel’s design. The hotel interior has a spatial advantage of vast, unobstructed double volumes in open areas such as lobbies and the all-day dining restaurant. On multiple levels, the volume of space is constantly mimicked with canopies of intrigue and metal screens to accentuate an effortless spatial transition between rooms. Selected architectural finishes such as stone and wood are usually muted in color yet characteristically expressive with their textures. Various seating arrangements placed throughout the open lobbies are tastefully selected and configured to provide much-needed pockets of residential sanctuary to visitors. Walkways and breakout areas adjacent to meeting rooms are subtly integrated with an expansive functional hallway whenever required. 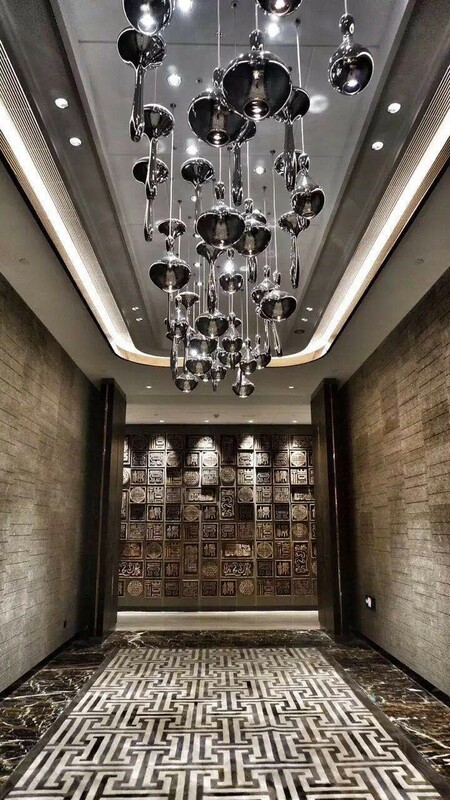 Gleaming metals are sparsely adopted as detailing elements to reward an occasional sparkle in the grandeur of the hotel spaces. Decorative soft free-standing leather panels further layer these spaces with a nod to delicate stitching details and aquifer-inspired artwork. The layout of each room is intuitive and invokes gratifying experiences for all guests. A bespoke signature mini-bar cabinet offers convenient refreshment, while touch-sensor bedside wall sconces and specifically designed control panels present accessible technology in each room. Curvilinear elements such as soft leather bed headboards offer a distinctive environment of minimalistic luxury. Sublime soft curves and an acute attention to details are revealed in the pairing of furniture and artwork. 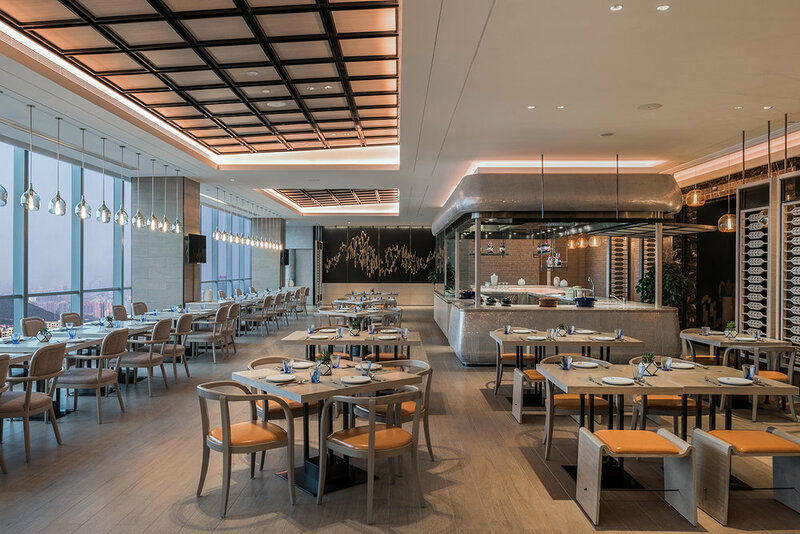 Hilton Jinan comprises four distinctive areas dedicated to the food and beverage experience. Most of the furniture and fixtures are modern, bespoke pieces that exude luxury with fresh, neutral and warm materials.